Thank you for taking the time to share your opinions and experiences in the 2018 annual demand survey! Each year, we ask for your feedback in order to better understand the challenges facing our communities’ ability access capital, and what kind of support community development practitioners need to be able to bring their projects to market. Download the full demand survey here. There is a profound lack of access to capital in South Carolina. Over 60% of respondents reported their organizations’ assets and annual operating budgets as less than $400,ooo. Additionally, 68% of respondents reported that they have not secured enough capital to adequately finance their community development projects, which is a 20% increase over 2017’s survey results. 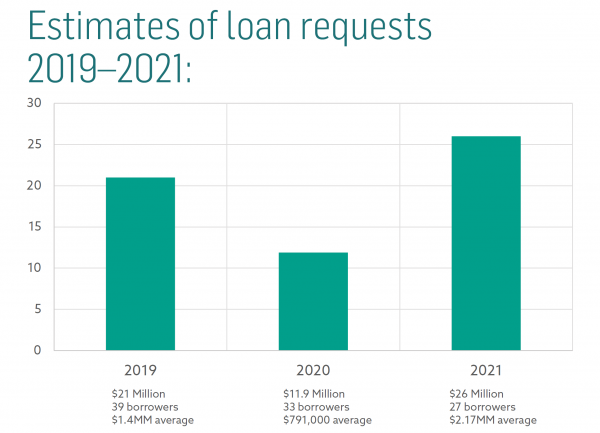 Challenges in securing financing included insufficient collateral and equity, which points to the cyclical nature of disinvestment, particularly for low-income communities. Despite the lack of capital access, South Carolinians are eager to transform their communities. Respondents estimate demand of nearly $59MM through 2021, which is a more than $17MM increase over last year’s anticipated demand. When asked if they were likely to borrow from SCCLF in the near future, 71% of respondents said yes- a 25% increase from 2017. Despite the many challenges facing potential borrowers, the outlook is is positive for community development efforts across our state. South Carolina Community Loan Fund is in a unique position to create change in communities suffering from persistent disinvestment. Continuing to invest in community means increasing SCCLF’s technical assistance offerings, outreach efforts, and growing our lending capacity. Learn more here about how your support can make a difference across our state.